Paula McLain received her M.F.A. in poetry from the University of Michigan and has been awarded fellowships from Yaddo, the MacDowell Colony, and the National Endowment for the Arts. She is the author of two collections of poetry; a memoir, Like Family: Growing Up in Other People’s Houses; and a first novel, A Ticket to Ride. She lives in Cleveland with her family. I was never a fan of Hemingway, but have always intrigued by his larger than life personality. Paula McLain has weaved a wondrous blend of fact and fiction to bring the story behind Hemingway's first wife and love Elizabeth Hadley Richardson. If you look at pictures of Hadley from her youth, you can see her looks very clearly in her granddaughters, Mariel and Margaux. I imagine she must have been stunning with an amazing personality and sense of humor to capture Hemingway's heart so thoroughly. McLain's theorizes these ideas fully in this fictional account of their romance based on letters, written accounts and Hemingway's story, The Sun Also Rises, based on his own experiences. This book is for anyone looking to revisit The Cafe Society in Paris during the 1920's. I got the feeling that while Hadley loved her husband dearly, she didn't really fit in with Cafe society since the lax morals didn't suit her upbringing. It is fascinating to read how she dealt with Hemingway's affairs and the fact that he brought his soon to be mistress, Pauline, into his home life. Hemingway must have been like a rock start in that world. It must have been amazing to live through such a time period. I am such a huge fan of books like this, that take fact and work out the details so a story can unfold. It reminded me of Loving Frank by Nancy Horan which I adored. It even makes me want to go back and reread Hemingway's work. Of course, this story couldn't have been written without the famous characters and it is a fascinating romantic tale. I received this book from the publisher at no expense in exchange for my honest review. This giveaway is sponsored by Ballantine Books and up to five copies of the book will be available. I just read this and I have a review coming myself next week. Although I can appreciate your perspective I was ultimately disappointed by the book... it just felt too much like a biography with dialogue and not truly the novel I was craving, with all the heart that implies. I thought Paula's Q&A at her website about the book was very interesting. And her comments about Hadley referring to herself as Victorian vs. modern, especially in the 20's, is a very interesting detail of her character. I just read a review for this in EW as well, it looks like a book I'd really like. Thanks for the info and chance to win! Hmm, I'm torn on this book because I really really dislike Hemingway, and I don't mean as an author. I am not a fan either. But I think this story would be interesting. I saw that Horan did a quote for the book at the website. We should talk about Loving Frank sometime! I found the discussion about Fact vs. Fiction on the book's website fascinating. This book looks great, i'm so fascinated by this time period. i went to her site and i absolutely loved the photo gallery. thank you for the contest! I found the timeline of Hemingway's life very informative. I always like A Moveable Feast, found it more accessible to me than fishing stories. Looking at the website just makes me want to read this book more. Count me in for today. 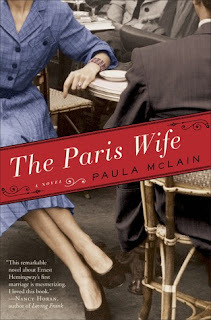 I agree completely with Paula McLain that the time she writes about in The Paris Wife, Paris in the Twenties, is a completely fascinating time. It must have been a daunting but also very satisfying task to immerse herself in that amazing era. I'm a big fan of Hemingway and I really got a kick out of seeing the photos that the author posted of him on her website. When I was in my 20s, I read all of Hemingway's books. I was in awe of his brilliant writing. This book, I believe will bring back good memories of when I read Hemingway. Count this big Hemingway fan in for today. I think this book would be a great way to learn more about this part of Hemingway's life. Sounds like a terrific examination of Papa's expat life in Paris. Fingers still crossed. Hope you pick me! This Hemingway fan would really like to win. Would love to win this one. Count this Hemingway fan in. Just remembered this morning that Hemingway would sometimes stop writing midsentence. He said it was a great way to ensure that he picked up his writing with the same amount of intensity the next day.